I used to be daunted by the idea of making tea without a teabag, but I soon found it’s not hard to get the hang of. There is actually more than one method of brewing tea; the steps outlined below are the traditional Western method, which is the most common method in the United States and the easiest to find equipment for. Bottled or filtered water recommended. Good water provides a clean base for the tea; too many chemicals impact the taste. If you use tap water, run it cold for about 10 seconds before pouring. This aerates the water, which brings out the flavor. I use a small ceramic tea pot and a tea strainer. This particular strainer has a rubber-rimmed lid that keeps you from burning your hands. Microwaves are a last resort. They reduce the oxygen content in the water, flattening the taste. 1. Heat some water, pour it into your teapot, and swish it around to warm the pot. 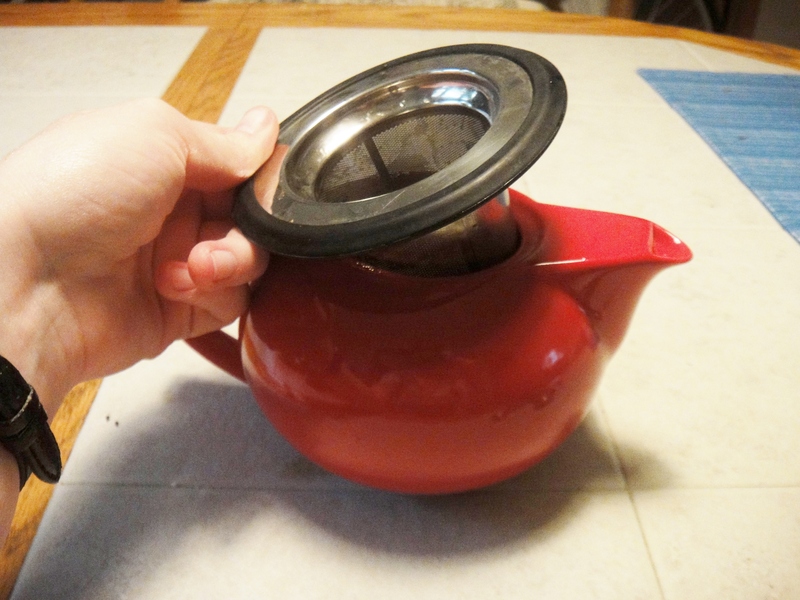 This prevents the water temperature from dropping as you brew the tea. 2. Pour out the teapot-heating water. 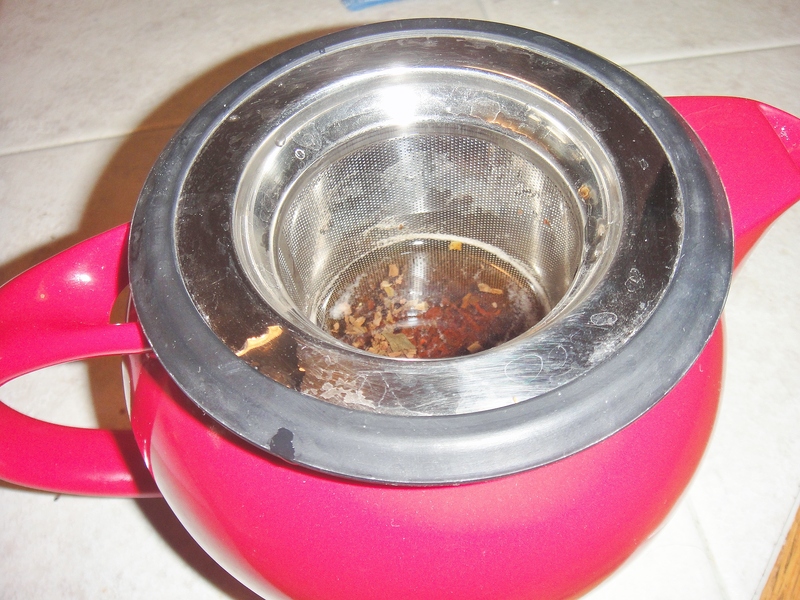 Don’t use it for the tea; reheating water reduces its oxygen content, making it taste flat. Tea leaves steeping in water. 4. Heat your tea water according to the instructions with the tea. Use a water thermometer to monitor temperature. 5. Place the infuser in your teapot, then pour the heated tea water over it so that the water absorbs the flavor from the leaves. 6. Steep the tea for the recommended time. If in doubt, go shorter. This is where timers are helpful, especially if you’re like me and tend to wander off. 7. Pour tea into cup and enjoy! 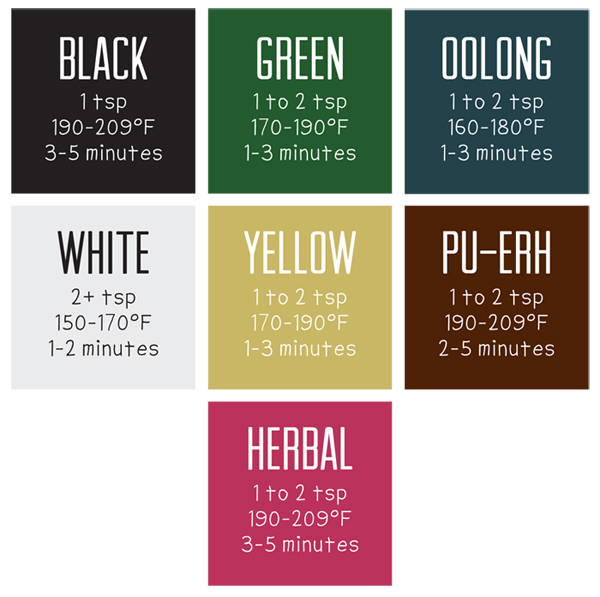 This chart from Stash Tea gives some general guidelines for tea measurements, water temperature, and steep time for each tea type. Experiment! Loose-leaf tea is all about the variables. Did you cup come out a little bitter? Try cooler water or a shorter steep next time. Not enough flavor? Try more leaves or a different way of heating the water. Also, the steps I outlined will get you an optimal cup of tea, but you’re not “doing it wrong” if you don’t follow them to the letter. I have been known, especially at work, to drop a tea strainer into a mug filled with microwaved tap water with no thermometer in sight – and I still enjoy the tea. If there’s one rule to making tea, it’s cherish the experience. Be patient with yourself! Tea takes time both to make and to master. It’s okay to make mistakes. I certainly did when I got started, and I still do. They’re as much a part of the experience as that absolutely smashing cup of tea you get just right! This is excellent! God, I love me some tea. Are you familiar at all with Teavana’s tumblers? They come with little baskets so you can brew your tea in them. It’s a bit obnoxious because you have to find somewhere to put your leaves when you’re done brewing, but oh, my goodness. I once made tea around 6pm at work. I forgot it because I got busy, came in at 3pm the next day, and it was still on the hot side of warm. I swear, they make them with magic. http://www.teavana.com/tea-products/tea-cups-mugs/travel-tea-tumblers/p/red-matte-contour-tumbler is the one I’ve had for years. I’m glad you enjoyed this post! And YES! Those tumblers (I almost said Tumblrs) are lifesavers! I’ve got a few of them kicking around my place. A piping hot cup of tea that I make before I go into work is still drinkable by the time I leave for home.